Pine nuts--also called pignolia or pignoli nuts--are one of the main ingredients in traditional pesto. You will find them in bulk, bags, and jars. But no matter how they're packaged they come with a high price tag. And that's due to their slow growth and difficult harvesting process. Pine nuts come from pine cones and take roughly a year and a half to mature (but some may take double that time). Once ready to harvest, the pine cones are smashed and the nuts have to be separated by hand from the pine cone fragments. But wait, there's more! Pine nuts have a second layer, a shell that has to be removed before eating, which can be thick and challenging to take off. Thus, all of this time and labor warrants a pricey nut. So more the reason to correctly store your pine nuts. The high oil content makes pine nuts quickly turn rancid if not stored properly. If you are buying from a bulk provider, use your nose and avoid any nuts that smell rancid. Purchase from a source with a high product turnover to ensure optimum freshness. Packaged pine nuts can be found in both the nut section of the supermarket as well as the gourmet Italian aisle. You can assume the nuts are all of a similar quality, but you may find those in the gourmet aisle will be sold in smaller quantities and are more expensive. Pine nuts should be kept in an airtight container in the refrigerator for one to two months. If you wish to extend the shelf-life, place pine nuts in a heavy-duty freezer bag in the freezer for three to six months. Once pine nuts turn rancid, they will give off an unpleasant odor and often develop a bitter taste. You may also notice that mold has appeared. 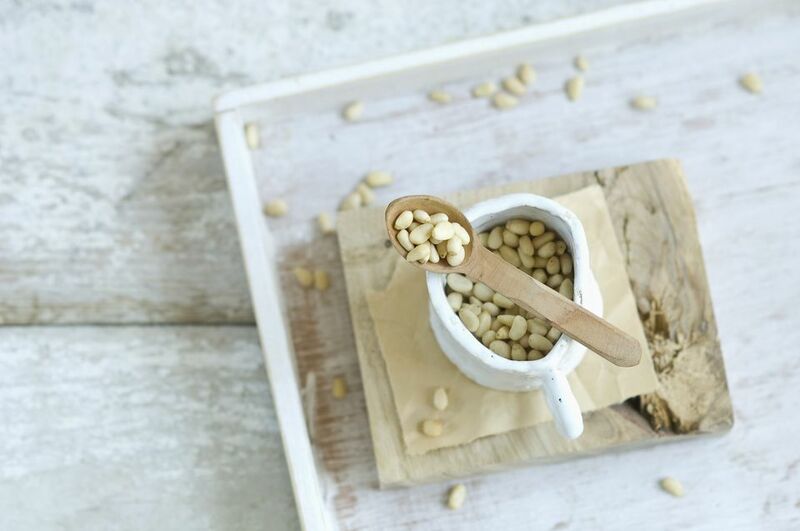 Before adding to recipes, it's best to toast the pine nuts until golden brown and fragrant. This enhances their buttery flavor and makes them more attractive when sprinkled on top of a dish. It also may reduce the chance of experiencing "pine mouth," a metallic taste in your mouth after eating raw pine nuts. It begins 12 to 48 hours after eating the nut and can last anywhere from a few days to a couple weeks. The FDA has confirmed this is not an allergy but simply an adverse reaction to pine nuts.